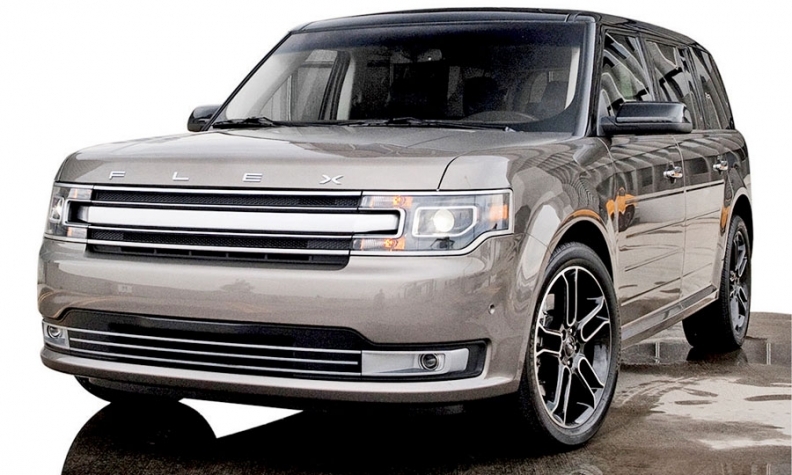 The Ford Flex has a distinctive look, good reliability ratings and happy, loyal owners. It's one of only two 2015 Ford nameplates recommended by Consumer Reports, and half of Flex buyers are new to Ford. But it was also the brand's slowest-selling U.S. nameplate last year, averaging just eight sales per dealer. And after seven years on the market, there's also no sign of a second generation in the offing, suggesting that the boxy, seven-passenger crossover may not be long for this world. So far, though, the Flex, which was freshened in 2013 but has received few improvements otherwise, has been spared for two key reasons. 1. Ford says it's profitable -- even though last year's sales were just a quarter of the 100,000 annual pace that then-marketing chief Jim Farley targeted at launch in 2008. 2. Californians love it. About a quarter of Flex sales occur in California, where Ford is eager to make inroads, and its polarizing design, reminiscent of iconic wood-paneled surf wagons, is more appreciated. "You either love it or you hate it," said Lee Dibble, a sales manager and Vista Ford-Lincoln of Oxnard, a coastal city near Los Angeles. "It's one of our top sellers. Lease loyalty on it is very high. People lease it and then come back and get another one." The dealership sold 19 Flexes in the first eight weeks of the year. Across the country, Tom's Ford in Keyport, N.J., may not sell that many in 2015 and 2016 combined. "If we sell one a month it's a lot," Larry Doremus, general manager at Tom's Ford. "I love the car, but we're never going to do volume in it." Outside California, the only market where the Flex sells in sizable numbers is Detroit, where employee discounts make it popular. "It's becoming a regional product that we're embracing as such," said Matt Zuehlk, marketing manager for the Flex and Explorer, large crossovers that share a platform with the Ford Taurus and Lincoln MKT. "California's a big opportunity for us." The Flex, which starts at $29,995, including shipping, and can cost $50,000 fully loaded, has a lower, more wagonlike profile than minivans and other competitors with three-row seating, including the Explorer, Chevrolet Traverse and Toyota Highlander. Through January, Flex sales since launch totaled 194,286. Ford sold 209,994 Explorers last year alone, including the Police Interceptor variant. The Explorer's revival has "allowed Flex to be this really niche vehicle that people really love when they come into the brand," Zuehlk said. "With the margins and cost we've engineered out of it, 20,000 units is more than enough to sustain the business," he said. "Flex isn't going anywhere." As for why Ford hasn't yet announced a redesign, Zuehlk said the 2013 freshening, which took the retro styling in a more modern direction and added safety and comfort technology, "was progressive enough to carry us forward for the interim."